The Modernist Studies Association has announced its short list for the MSA Book Prize (for a book published in 2017). One of these books will be presented as the award winner in Columbus at our 20th annual conference, November 8-11. We offer our congratulations to all of the finalists. Two decades after the founding of the Modernist Journals Project, the archive of modernist little magazines seemed settled, the protocols for studying them established. 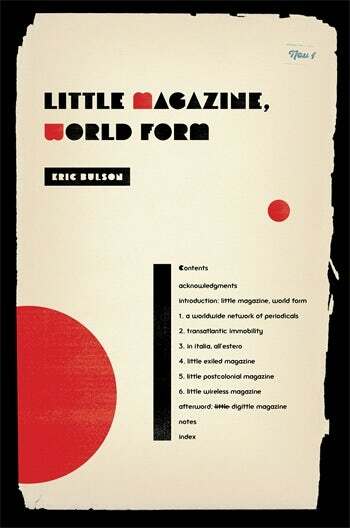 Eric Bulson’s Little Magazine, World Form dramatically alters this consensus, by expanding the field far beyond the dense population of European and American magazines, and by foregrounding the formal and material particularity of the medium. Opening the field to the discursive procedures of media studies and world literature, two fields that have much to learn from each other, Bulson shows the form of the little magazine to have been as globally consequential as that of modernism, as it has been heretofore understood. Bulson honors the familiar story of the little magazine as the engine of international modernism, while also emphasizing equally critical instances of magazines’ failure to circulate, their exile, immobility, untranslatability, postcolonial failures or refusals of cultural reciprocity. In doing so he provides fresh accounts of canonical modernism’s early magazine publication, while bringing forward a vast archive of little magazines from nations not limited to Argentina, India, Nigeria, Jamaica, Japan, Poland. Little Magazine, World Form presents the little magazine as something of a character in its own right, a register of global political change, and an adaptive means of communication. Its chapters are appropriately asymmetrical, and the book non-hierarchical: despite its breadth, it provides no master narrative. Instead, it invokes a network still larger than the one it documents, inviting — demanding — further work. The expectation that poets should also write criticism is an idea that has become almost as naturalized as the association of poets with the culture and curriculum of the university. 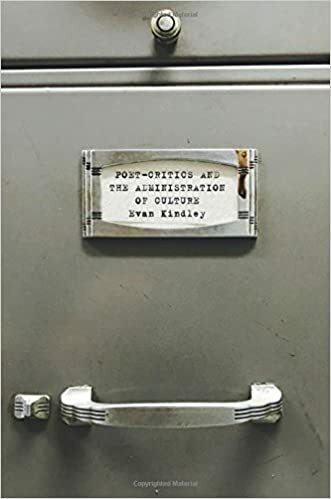 With a keen eye on the years between the Great Depression and the early postwar period, however, Evan Kindley’s Poet-Critics and the Administration of Culture returns us to a world where the university was only one of several possible refuges for poetic culture. During this period of radical cultural instability, poet-critics sought means of supporting their own and others’ poetic work, and forms of protection from an indifferent marketplace. As Kindley reveals, this relief was discovered not only in universities, but across a range of midcentury institutions, most notably government agencies and philanthropic foundations. The price of gaining such partial autonomy was to become an advocate for the liberal state, and subject to it. But it was also, as Kindley shows, often viewed as an opportunity, not only to secure a durable location for modernism, but one in which the poet-critic could be socially authorized as an expert arbiter of culture. A surprising but revealing emblem of this argument is the fact that so much of this institutional story should be imprinted in the poets’ verse. Alongside genuine archival discoveries, Kindley’s readings of Eliot, Auden, Marianne Moore, Sterling Brown, Archibald MacLeish and others provide us with new understanding of those poets and the sometimes very large claims they were willing to make on behalf of verse culture. Genially written but incisive in its analysis, Poet-Critics and the Administration of Culture is a model of economy and style. Kindley shows how these poet-critics were the architects of the world we now inhabit, albeit in a situation of far greater precarity. This book is essential reading for anyone interested in why and how we might defend this tenuous arrangement today. When we think of postwar American architecture and the modernist aesthetics that it bequeaths, we think of Frank Lloyd Wright, Walter Gropius, Marcel Breuer, Philip Johnson, and other famous men. Few people would think of Elizabeth Gordon, editor-in-chief of the popular consumer magazine House Beautiful. 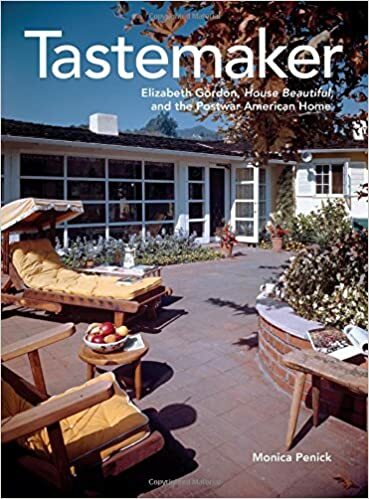 But Monica Penick's monograph Tastemaker: Elizabeth Gordon, House Beautiful, and the Postwar American Home is about to change this. Simultaneously a rich history and an incisive analysis, this book gives us an engrossing account of how Gordon, through her magazine, shaped --indeed, made de rigueur -- some of the fundamental questions we ask today when it comes to our living environment: what is a "good design"; why that is of value; and what constitutes "better living." Indeed, Gordon may be the precursor to what we today call an "influencer," except her agenda is far from trivial. Preoccupied with issues of design as an ethics of the quotidian, with the challenges of the climate control and American regionalism, Gordon used her magazine House Beautiful as a vehicle to promulgate her philosophic and intellectual ideas. And, as Penick so beautifully documents, Gordon's editorial programs reshaped ideas about American living, and, by extension, what consumers bought, what designers, made and what manufacturers brought to market. This implicitly feminist treatise also reminds us that, when it comes to understanding modernist architecture, design, and taste (which is to say, value), we would do well to turn our attention beyond the usual sources (for example, professional and often predominantly masculine architectural journals) to the presumably domestic and more peripheral site of a “woman’s magazine.” Elegantly written, full of unexpected archival details and gorgeous photographs of mid-century architecture and design, this book reinvents the archive of modernist aesthetics. Bachelor Japanists is a deeply researched, beautifully written, rewarding account of Western connoisseurs’ engagements with a Japan of their wishful imagination across almost a century. As we travel from Paris in the second half of the nineteenth century, via early-twentieth-century Boston, to Seattle in the 1940s and 1950s, we meet an arresting range of ‘bachelors’—not always unmarried, and, indeed, not always men—who found in Japanese culture whole new ways of being and seeing. Reconstructing in compelling detail such estranging and emancipating encounters in what is among many other things a tour de force of cultural-historical storytelling, this original, assured, and independent-minded book takes seriously not just the pitfalls of fantasy but also its potentially life-changing pleasures. Each year, the Modernist Studies Association seeks nominations for its Book Prize, awarded to a book published in the previous year. A panel of judges determines the book that made the most significant contribution to modernist studies. The winner receives $1,000 plus up to $600 toward travel expenses to the MSA Conference, where the award is presented. A book first published in another year will not be eligible for the prize. This exclusion applies even if a new edition (paperback or revised, for example) was published in the award year. Please visit our Nominations page to recommend a book for this year's prize. Visit our archive to see previous winners.